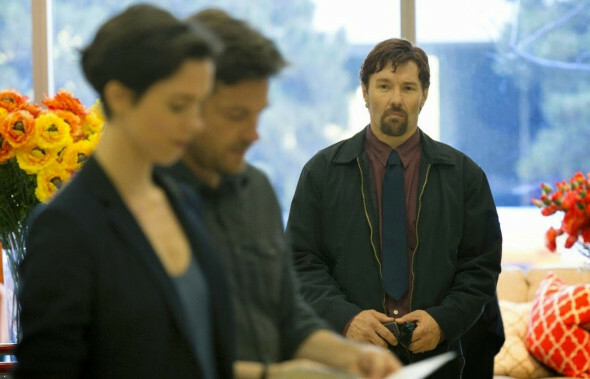 Joel Edgerton is determined to set our nerves on edge with The Gift, and he succeeds pretty well. The writer/director/co-star knows just how to push the audience’s collective buttons. The tale revolves around Simon and Robyn (Jason Bateman and Rebecca Hall), who no sooner move into their new California home than they run into one of the husband’s old classmates: Gordo. Thanks to Edgerton’s subtly creepy portrayal, we instantly distrust this guy—to the extent that our stomachs tighten a little when Gordo overhears the couple’s new address. Sure enough, he’s soon showing up unannounced, invariably when Robyn is home alone. Annoyed, Simon recalls that Gordo was always a “weirdo” and suggests that he has the hots for the pretty Robyn. She, on the other hand, thinks he’s just trying to be helpful. Robyn, as we eventually learn, is not an accomplished judge of character. As Gordo’s behavior grows more and more erratic, director Edgerton builds tension by supplying a series of shocks constructed in the time-honored fashion: He primes us with scenes of quiet dread followed by a sudden sight or sound. These are fun, especially when experienced with a vulnerable audience. But Edgerton’s goal ultimately extends beyond eliciting Pavlovian responses. We learn that Simon has more history with Gordo than he’s willing to admit. It’s an ugly history that Simon would like to forget and that Gordo is unable to let go. Frankly, there’s a bit of a disconnect between the early scenes, with their stock shocks, and the third act, with its unexpected complexity. That’s one of the few signs that this first-time director has more to learn. A bigger disappointment is that the tale’s female lead is less interesting than her male counterparts. Edgerton’s Gordo, as stated, is wonderfully creepy, while Bateman’s Simon has a tendency toward ruthlessness that becomes increasingly obvious as the story unfolds. As for Hall’s Robyn, we never quite get a handle on her. We know she’s an accomplished interior designer, mostly because her husband tells us she is. We also know she has a history of pregnancy-related trauma and addiction. But she mainly comes across as simply a woman in danger—more of a plot device than a flesh-and-blood character. Hall makes her watchable, but Edgerton’s script fails to make her knowable. The result: Even though The Gift continually scares us and surprises us, it never quite moves us.